Joe's Tug is a dive site located off the Florida Keys. It is not, as the name would seem to imply, actually a tugboat. Rather it is the site of a steel-hull shrimper which measures 75 feet in length. Joe's Tug was going to be moved to a site off the coast of Miami to serve as an artificial reef, but the night before the boat was going to be towed toward the Miami coast, she was intercepted and stolen (no one knows who did it). Whoever took the boat attempted to move her somewhere else, but she sank before reaching her destination. That's how she came to rest in her current location (N 24 27.850 W 081 44.270), 65 feet below the surface of the sea. At this depth, the boat is an intermediate dive. Advanced divers should have no problem with it, and even most novices should have no problem with the depth. The boat landed in the sand and was torn apart by Hurricane Georges in 1998, so that she now rests in two halves separated by 30 feet. The wheelhouse is no longer recognizable but you should have no problem identifying and accessing the hull of the boat. Schools of fish typically hang out in the hull, and sponges and coral have clustered up around the upright vessel. There are a number of moray eels that call the boat home and which are friendly to divers, and a famous Jewfish named "Elvis" by the locals also makes his home on Joe's Tug. The visibility of the area is usually excellent, and the colorful sea life makes for great photogenic opportunities. 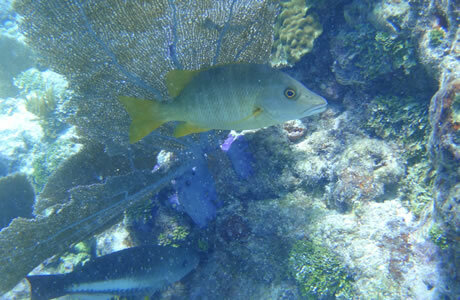 This is one of the most popular dives in the Florida Keys for reason of its accessibility and beautiful marine life.